But have you tried? Seems lots of people haven't even tried but are afraid of low seeding rates. It took me years of "trials" to get comfortable with what I am doing here on a farm wide scale, but doing some strip trials shouldn't scare anyone. Once I learned my crop wasn't going to fall over I soon managed for higher yield, could never do that with a flat crop. We have a planter. After a few years our conclusion is grazing corn is going with the Pillar as the yield is always higher solid seeding, better SBU then 30", and much better weed control. Same with the sunnies and probably will sell the planter. Seeding higher with solid increases yield again with this as we are able to use more ground. This is not grain corn. You farm some of the best dirt in the world with a nice long season and lots of rain, that is so not like most of the rest of western Canada. You don't need a planter to seed 2 lbs an acre canola, just a good seeder. Canola is mostly indeterminate making it a very poor candidate to finding any sort of advantage with a planter. Would love to see some trials one way or the other if you think the Lacombe 4 year trials are wrong. I think guys have gotten tired posting 2 lb seed master pictures that look exactly the same as a planter at much lower cost so its not a matter of could, its should. lol @ corn and sunflowers with a drill. The only way to know for sure what's good for your operation is to try it for yourself. Opinions on stuff like this are useless. Our findings over 10 years was canola with a planter at a low seeding rate worked better than anything else we've done. Other people might not observe the same though. I get sick of guys like Brian discounting our findings saying things like "but you have better dirt and climate so basically your findings don't matter", that's annoying. But to each their own. Last edited by jcalder; 04-14-2019 at 11:13 AM. I'm not discounting your findings, take a breath. I'm saying after careful yield trials, it doesn't seem to work as well here and I think mostly because of SBU. Last edited by BrianTee; 04-14-2019 at 12:46 PM. There is a huge difference in heat units between where SWMan farms and I do. Between frost, flea beetles, seedling disease, and cold slow spring, the biggest mistake I can make is not enough plants to finish quick enough in the fall. Yes our growing season is much longer, however the four main challenges you listed are the exact same as mine. We got too the point of seeding 6lb just for extra insurance against those same risk factors, and one cold night and it is still all for not. The majority of our acres seem more prone to frost than surrounding areas. It sounds like BS, but for whatever reason, frost seems to impact certain areas harder than others. Anyway, to me trying a planter is the next attempt at mitigating the risk of frost damage. After A LOT of canola stand scouting after frost, there ofter is a much higher survival rate on blacker dirt. Typically more trash = more frost damage. I think it is due to the blacker soil warming up more during the day. So I think that delaying seeding date, and then planting with a trash whip could be a solution on our farm. Blacker soil bed and even seed placement, should pop up and out grow flea beetles and compensate for delayed seeding date. BrianTee and brazil08 like this. Oh and it's hardly the garden of Eden here, 4" of in-season rainfall last two years. We have good dirt but it is rarely more than 6" deep. Remember I don't farm in the RRV. However I am not prepared to make excuses and take a back seat to anyone on production and you should not either. We simply need to keep searching for what works best on our own farm. Something just occurred to me, maybe you are short on heat units because of straw cover? Could be as simple as something like that which throws off the dynamics. brazil08 and jcalder like this. Edit: You're right, I shouldn't say your land is better. Sorry bout that. My wife is from Miami/Roland. That land is grossly nice. Don't think the discs are shiny when they are done planting. When you put canola in with the planter, what are all the passes? Or is it a one pass system? Our heat units are short, because we live on 53.5 degrees. Our straw isn't on the ground, its standing up. Stripped fields are the first fields that melt all the snow off. Pic is plot glyphosate/glufosinate tolerant canola - I think it will be available commercially next year or so, about 3 lbs as there wasn't much seed. Pretty as a planter crop. You can just see the planter planted corn pollen barrier in the distance. We had to till that to plant corn. Last edited by BrianTee; 04-14-2019 at 03:41 PM. It amazing how every area is so different. 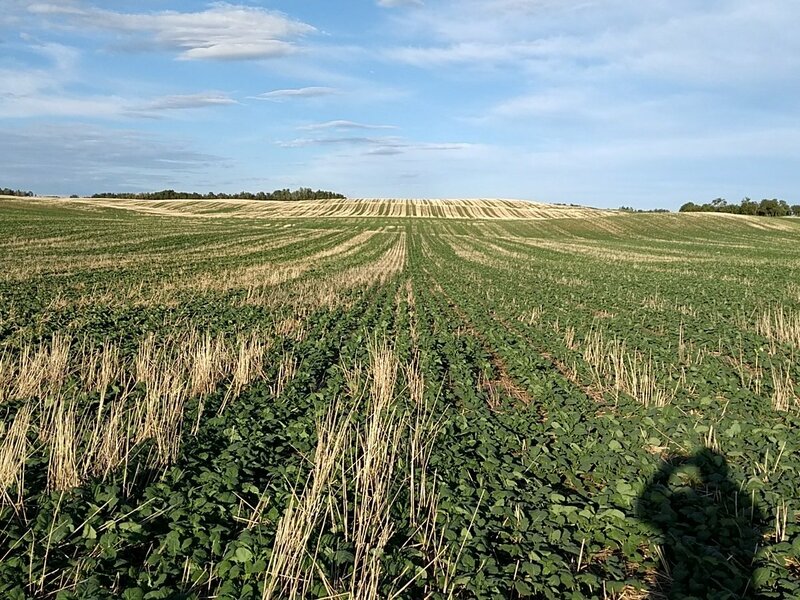 I like the picture of kirshenman's field with all the straw cover, but if we were to try growing canola in that kind of conditions, it would be a complete failure. Canola would never come up through that and if there was anything close to a frost, it would be wiped out. I would love to try out using a planter for canola, but not going to go buy one just for a demo, and had terrible experiences with MRB, so that is on the back of my mind when considering using anything with a disk on our land. It's funny watching people argue over what is better when they are basically on two different planets. What is the average seeding rate of canola across Western Canada? - my opinion would be that it certainly could be higher than 3.5lbs/acre even though doubt anybody with a planter would be over 2lbs/acre. Of course, while we at it may want one on what is preferred TKW of canola seed for farmers in Western Canada? - my opinion is that anybody using airseeder with 3lbs/a or less seed/acre it would be 4.5 or less vs guys with planter that would prefer 5.5 or higher. What is the avg number of passes for canola seeding used for the farmers that are shooting for "higher" yields? - of course would first have agree on what "higher yields are, but my opinion is that it is over one pass even though for some this is the equivalent of saying your a Muslim in Western Canada. There are some "real" cost implications to the above even if there was not a yield advantage for planter canola. Also - in the fake or "worthless" news department as it relates to planter canola: what does - https://albertacanola.com/wp-content...for-canola.pdf - have to do with planter canola? It must be a slow day at church today or everybody mulit-tasking between NHL playoffs.